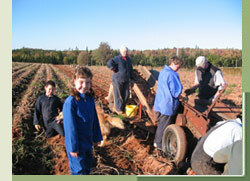 We grew up on a mixed farm in the community of Kinross (32 km east of Charlottetown on Route 210). Since Mom and Dad had four daughters and no sons — we, girls were very much involved in the day to day operations of the farm; from the caring for the beef herd to crop production. This practical experience lead us both to study agriculture at McGill University. Following graduation we both chose to work off-the-farm primarily because of the economics that exist within the business of farming. We have the best of both worlds as we are still involved with the farm during the evenings and weekends while at the same time benefiting from the continuity that exists with a off-farm income. Dad (John) and Mom (Isabel) are still very involved with the day-to-day operation of the farm. The 100 year old farm is very much a family operated business with sisters, husbands and nephew/niece involved when extra hands are required. 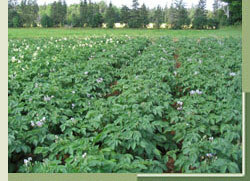 In addition to our small speciality potato acreage, the 250 acre farm also grows grain in a three year rotation and has a herd of 30 crossbred cows. We are also committed to growing the highest quality beef in harmony with preserving the incredible natural resources that surround us. The mostly Angus-crossed cattle are raised on pasture and never given hormones or antibiotics used to promote faster growth and weight gain. Because the herd is small, the cows and calves are able to enjoy acres of green grass during the summer and yearlings are finished on natural grains and forage to provide incredible flavour, tenderness and marbling. Our cattle are marketed locally through a farmer-owned abattoir, Atlantic Beef Products. In 2006 and 2007, the farm received the Atlantic Beef Products Award for Outstanding Achievement in Meeting Brand Specifications. 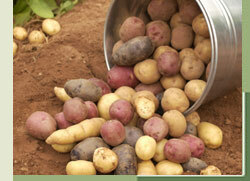 Should you have questions on our sustainable practices, please contact us.